If you’re serious about producing music, it’s absolutely essential to have a pair of quality studio headphones. A big mistake some aspiring producers are making is playing back their beats on a couple of standard headphones. The best studio headphones allow for a detailed and natural sound, and they have a flat frequency response, which basically means they don’t alter the sound coming from the source. We have collected 7 of our top candidates below. They’re all a good pick, but if you’re really interested in choosing the right pair for you, I suggest you read the entire guide. There are, of course, two main tasks that require studio headphones. These are recording and mixing. When a musician or vocalist is being recorded, he or she usually wants to listen to aguide track. Most of the time, the guide track is simply what’s already been recorded. Like the drum beat or guitar riff. It is absolutely essential that this guide track doesn’t leak into the microphone, as this would spoil the recording. Thus, the best headphones for recording are closed back, circumaural studio headphones. Let’s get one thing straight first. It’s rarely a good idea tomix an entire track through a pair of headphones. Tracks sound differently through headphones than they do through a studio monitor. That being said, we’re often required to use a pair of headphones over monitors. This can be when working late at night, when a monitor would wake the neighbors. Or if you’re on the move, without a monitor. Monitors also rely on the room acoustics. Thus, if the room has bad acoustics a monitor is a no go. The headphones have an advantage here. The best headphones for mixing are open back studio headphones. Sound Quality – A good pair of studio headphones can deliver an exceptional sound. They are capable ofblocking out unwanted noises, thus confining the essential sounds that are released through the headphone speaker. They are one of the best means of controlling the listening environment. 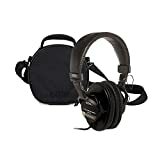 Portability – Many producers do a lot of traveling, making a pair of portable studio headphones ideal. In studio set up, listeners are mobile, which requires portability of their wares. Studio headphones provide the best sound quality while still being portable. The headphone industry can be very difficult to navigate. When it comes to studio headphones, there are a few very important things to consider. In this section, we will go over them in detail. We asked a couple of experts on the field what they thought was the most significant detail to consider when looking for a good pair of studio headphones. Here’s what they had to say. I think it depends on the studio application! Here is the critical question to ask first: Are you going to be doing tracking or editing or mixing with the headphones? If you are going to be doing tracking, then the most important feature is whether they are closed-back or not (to prevent leakage into the microphones). I like the Sennheiser HD280 Pro for tracking. They sound very good, isolate well, and they are under 0 if your musicians break them. If you are editing, then the most important features are comfort (for long sessions with the headphones on) and detail (the ability to hear sonic minutiae). For mixing, you want headphones that cover every octave equally well but are not hyped in the high and or low end of the frequency spectrum (which will throw off your mix). I like the Audio-Technica ATHM-50 for mixing. They just seem to have the best all-around sound for the money, and the bottom octave is rock solid. Can you get better sound? Sure, but you’ll pay handsomely for it. And can you mix using headphones? Absolutely (I do it all the time), you just have to be aware of the limitations of doing the mix that way. Make sure you check the mix on many different sound systems in conjunction with the headphones. If I had to choose just one set of headphones for my desert island studio, it would be the Audio-Technica ATH-M50. John is a great guy who knows what he’s talking about. Without a doubt, you’ll have a difficult time getting your mixes to translate well on a variety of playback devices (the ultimate goal of any mix) if you’re mixing with headphones that are hyped in the lows or highs (e.g. Beats). Sure, your mix may sound great in those headphones, but as soon as you compare your mix to a commercial one on, say, an iPhone’s built-in speakers, you’re likely to find your mix lacking in the lows, and probably a bit dull on the top too! In short, you want a pair of headphones with the flattest frequency response possible, so that you’re hearing the mix as it actually is. I think the most important thing to look for in a pair of tracking is comfort. It can distract the performer if they have to wear ill-fitting headphones, especially during long sessions. Look for ‘phones that fit OVER the ear and aren’t too heavy; sound quality is of lesser concern here. Jesse shares some of his thoughts over atThe Glow Recording Studio. Definitely worth checking out. Most significant detail would be honesty. No point having headphones that flatter or mis-respresent what’s happening in a mix. Phil is the studio manager at theEdwin St. Recording Studio. The most important detail for studio headphones is flat frequency response. Brandon posts regularly on his blog,Recording Review. Getting the correct type of headphone is crucial. The two main things we need to be concerned about are the cups and the backs. First, a little about the two types of cups. The circumaural cup is bigger than the supra-aural. This kind of cup surrounds the entire ear. This makes the headphones more comfortable to wear. Additionally, circumaural provide better sound isolation, thus are better at reducing sound leakage. The supra-aural cup is smaller. It presses against the ear, rather than around it. These aren’t as comfortable as the circumaural, but they are lighter. The circumaurals are better for most purposes. The only real reason to go with the supra-aural is if you want a pair of very lightweight headphones. For studio headphones, the circumaural cup tends to be better. It provides much better sound isolation. When you try them on, most of the sound around you should quite down. The blocking of outside noise lets you focus on what you want to hear. Sound isolation also keeps sound from leaking out. This is great for recording, as you do not want any sound to leak into your microphone. Studio headphones are often worn for long hours. To be able to do your work without any physical problems, the best studio headphones need to be comfortable. The headphone cups have the biggest impact on comfort, and again the circumaural trumps the super-aural. Each of thetwo types will be suited for different purposes. The main difference is that open backs sound better than closed backs, but they aren’t always as useful in noisy environments. This is because open backs let sound leak in and out of the headphones. Sound leakage can be a problem while recording. With open backs, sound might leak from the headphones into the microphone. In this case, closed backs are a better choice, as they do a better job on enclosing the sound. If you aren’t worried about leakage, but just looking for a better overall sound – open backs are the way to go. If, for example, you’re mixing or referencing, open backs will provide a wider and truer sound space, as well as a tighter bass. This is one of the most important considerations when looking for the best studio headphones. These aspects are largely related to thequality of the sound that the headphones are able to produce. For our purpose, a few specifications are more important than others. Frequency Response. This tells you what frequencies the headphones will be able to present to you. When looking at the specs, you’ll see a range going from the lower end to the higher end of the frequency spectrum. The lower will be measured in Hz, and the higher in kHz. This is a really important thing to consider. It allows you make sure that the music you’ll be making will be represented correctly on the headphones. The normal human hearing range goes from 20 Hz to 20,000 Hz (or 20 kHz), so if the headphones can play this range, then they can play every frequency that matters. You should also make sure that the headphones have a flat frequency response. Sensitivity. The sensitivity basically tells you how loud the headphones can play, in terms of volume. This is measured in decibel (dB). Impedance. The impedance – also called resistance – is measured in Ohms. Ohms are represented by the Greek letter, Omega. A pair of studio headphones with a high impedance are much less likely to get noise on the signal. They also provide a much cleaner tone. If you’re using your headphones for mixing, then a high impedance is a better choice. Headphones with high impedance will, however, be quieter. Thus, your iPod or smartphone might not be able to drive them loud enough, and you’ll need an externalheadphone amplifierto drive them. Some models are made of rich leather and quality metal. Others are ebony-encased and carved from durable, solid wood blocks. Whatever the design, it is important that the headphones are made of quality material. You don’t want them to break easily, especially if you’ve spent a decent amount of money on them. This is related to the one above. Technicians use their cans for long hours, thus require them to be solid and strong. Moreover, because headphones are used so frequently, they are exposed to constant beatings. The factor of regular wear and tear also leaves its mark. Choose a set of headphones that are durable – a set that can take a beating without breaking instantaneously. Again, you want your studio headphones to last a long time. This is one of the topics that comes up over and over again. The best studio headphones aren’t cheap, so make sure they have replaceable parts. Then, when something breaks you can just replace it, without having to get an entire new pair of headphones. This is a huge money saver, so it might be worth spending a little extra on a pair that comes with replaceable parts. The design and style of the headphones is simply up to your own preference. Do you enjoy plain and simple design, or do you want more of adesignerproduct? The best studio headphones available do not only sound remarkable, but look great as well. Thebeststudio headphones is actually a relative term. It depends on the users application, taste, and preferences. Finding the best studio headphones could mean finding the most acceptable piece at the most affordable price. Price does definitely come into play, when choosing a good pair of cans. There’s not much sense in spending an additional 0, only to see little or no improvement. This is why we have lined up the best headphones that we think are reasonably priced, given their specs and quality. The AKG K712 is a great pair of studio headphones. They are able to present a huge frequency range! Much larger than the human hearing, so you’ll be able to hear the music exactly as is. The circumaural design, combined with a great headband, makes them comfortable to wear for long hours. Wearing your studio headphones shouldn’t be a chore and AKG understand that. These headphones have a phenomenal sound quality. Sitting at 62 Ohms, the impedance is high, which makes the tone remarkably clear. These headphones are open backed, thus,sound a lot betterthan some of their closed back rivals. Being open backed, though, they aren’t very useful in noisy environments. They are, however, extraordinary for precise listening, mixing and mastering. AKG K712 comes with a detachable cable that connects to the left ear cup via a locking, mini XLR plug. While they can be driven with a headphone jack of a Denon receiver, they get a much more confident bass by using a dedicated headphone amplifier. The only real drawback with the K712 is the price. These are the most expensive headphones on our list. In my opinion, however, this is a reasonable price for the quality you’re receiving. Additionally, Amazon are known to give some great discounts on them from time to time. If you’re interested in the AKG, you might want to check outHeadfonic’s awesome review. Audio-Technica ATH-M50x is critically acclaimed on its sonic performance. The device has 45 mm drivers, which is larger than the 40 mm of the older ATH-M40x. It possesses an exceptional sound clarity and accurate bass response. The unit has a circumaural design that goes around the ears for superior sound isolation and comfort. It has 90-degree swiveling earcups for easy one-ear monitoring, and professional grade earpad and headband. The sound quality of Audio-Technica ATH-M50x is the same as that of the previous model, which is remarkable. Something new with the ATH-M50x is the removable audio cable, which is very useful if the unit ever has to be repaired. The headphone cushions are comfortable even when they are used for an extended period of time. The ATH-M50 is an unmatched combination of audio and build. This award-winning system is embodied in the re-mastered M-Series line. The model is perfectly suited for every type of listener. The contoured earcups are sealed tightly, achieving superior sound isolation. They are made with professional grade materials that are extremely durable. The M-Series headphones provide excellent audio and great comfort, which gets the job done over and over again. The Sony MDR7506 is quite a bit cheaper than the previous two models on our list. They are great for sound monitoring in recording studios, film production, radio – and virtually everything that requires excellent sound quality. They have a high impedance, giving them a very clear sound, but at the same time require more power to be driven. The closed back feature reduces sound leakage, a good match for recording studios. The Sony comes with a 40 mm driver, gold connectors and a professional-quality oxygen free copper cord. Specs aside for a minute. They sound a lot louder at a given input volume than a lot of other headphones. This is great, when you need to hear the headphones over the live sounds around you. The MDR7506 has excellent reproduction from bass into the high end. Are they comfortable enough to wear for hours? They are. The circumaural cups combined with the headband with generous padding make these studio headphones very comfortable to wear. They are durable, provide a clean quality tone and are comfortable to wear. All this combined makes them one of the best studio headphones on the market, at a very cheap price. Exceedingly accurate natural and wide frequency response. The KRK KNS6400 headphones are yet another closed back circumaural pair on our list. They have a wide frequency response, and an accurate sound. They have great isolation for noise leakage, and a very low distortion. Built for comfort – they are a lightweight pair of headphones, with adjustable low-pressure headband and memory foamed ear cushions. We keep hearing that sound is all, but it’s not! Rather, a good pair of studio headphones need to provide a good sound, but they need to be comfortable as well. Studio technicians wear their gear for hours upon hours, making a pair of comfortable headphones absolutely vital. Sennheiser have been involved in the headphone industry for a long time. They know what they’re doing, plain and simple. The HD 598 is a good example of Sennheiser at their best. With a frequency response going from 8 Hz to 27 kHz, a circumaural design, and an impedance of 54 Ohms – The Sennheiser HD598 sound great. The closed back keeps unwanted sound out and in. They can be driven at sufficient volume by a normal iPod, not all studio headphones come with that luxury. The Sennheiser 598 is a true and tested model, and are very popular. If you ever get the chance, go into your local headphone store and give them a tryout. We can almost guarantee you’ll fall in love. With a very reasonable price tag, they’re in the lower end, and it is definitely worth paying for one of the best studio headphones that are out there. In actuality, a pair of speakers can’t be run without an amplifier. Period. Headphones are basically small speakers, thus too cannot work without amplifiers. The reason why you don’t need an amplifier for your standard earbuds is that most music playing devices come with a built in amplifier. Your computer, iPod and smartphone all have built in amplifiers.Many studio headphones can’t be run on a sufficient volume by a standard jack. This is where the amplifier comes into play. It lets the headphones run at higher volumes. Some headphones require more than these amplifiers can do. Because of this, many studio headphones need an external amplifier to run properly. The purpose of the amplifier is not to blast your ears with the highest volumes possible. The amplifier is supposed to make the sound you hear clearer and more controlled. Whether or not you’ll need a headphone amplifier will depend on a few components. The most important ones are the headphone sensitivity and impedance. The sensitivity is often measured in number of decibels achieved with 1 mW of power. This is not always the case though. As an example, theAKG K712 PROis shown in SPL/V. Make sure you double check the units! There’s a nice thread on Head-Fi that discusses this issue. You canfind it here. Thesensitivitybasically tells you how loud your headphones can be played with a certain amount of power. A very efficient pair of headphones will provide 100 dB/mW. Efficient headphones are less likely to be in need of an external amplifier. Not all headphones are this efficient. As a very rough guideline, if the sensitivity is below 95 dB/mW, the headphones are more likely to need an amplifier. The other player in the game is theimpedance. Impedance is a measure of resistance, and is measured in Ohms (Ω). As a general rule, the higher the impedance the more your headphones will benefit from an amplifier. A high impedance will usually require more voltage to get a satisfying volume. On the other hand, a pair of headphones with a low impedance may require more current. They may be able to run loud enough on your iPod alone, but the quality of the sound will improve drastically with an amplifier. We can’t tell you with certaintywhether you need an amplifier or not. It’s a complicated subject, and depends largely on the individual headphones. If you’re in doubt, we recommend you go by your local Hi-Fi store. Simply bring your headphones and ask what they think. As ageneral rulethough, the larger the headphones the more likely the benefit from an external amplifier. Small in-ear headphones often won’t benefit as much as a pair of large studio headphones. There are four main groups of headphone amplifiers that are used professionally. They are thesimple amplifier,headphones distribution amp,“More Me” ampand themulti-channel remote-mixing systems. This amplifier is great if you only need to worry about your own headphones. If you’re recording more than one person, you might need a headphone distribution amplifier.The simple amplifier is exactly that, a simple amplifier. It goes directly in between the music source and the headphones. Its purpose is to enhance the listening experience. They allow for higher volumes and superior current capacity. These amps range from cheaper to the more high end amplifiers, often used by audiophiles. The headphone distribution amplifier is great for bands, where everyone wants to hear the same track at the same time.These offer more flexibility than a standard built in jack. These amplifiers have a single input and multiple headphone jack outputs. Most of them have volume control for each person as well, letting them control their volume as they desire. It offers the same basic idea as the distribution amp, but with a lot more flexibility. This one is for bands or groups of people who don’t necessarily need to listen to the exact same track. Each person can be listening to a different track, which, in many cases, is a great feature to have. The “More Me” headphone amplifier comes with several inputs and outputs. It offers mixing functions, letting each individual listener customize the headphone mix slightly. This system does everything the others do and more. Suffice to say, the average person won’t need one of these. This one is for the serious group of musicians – great for the studio.This is the top of the hill. The multi-channcel remote-mixing system provides each individual listener with their own mixer. This allows each individual person to fully customize what they hear. The essential qualities that you should look for in studio headphones are high quality sound, good bass, durability and comfort. What makes studio headphones significant is their ability to retain neutral sound signature, which means less coloration of sounds. The flat frequency response that the best studio headphones have lets you hear the music exactly as is. You don’t want an over emphasized bass or hyped highs. Studio technicians need to be able to hear their music exactly as it sounds – that’s exactly what studio headphones aim for. This brings an end to our definitive guide. You’ve now learneda lotabout studio headphones. It goes from our choice of the best studio headphones, to why you need them, to how to pick them, to reviews, to amplifiers, and a whole lot in between. If you have any questions, let us know in the comments below. If you enjoyed the guide, please share it with your friends. What’s left for us to do is wish you good luck with the extraordinary studio headphones that you’ve found!